For those who want to transform an ordinary living room into a stunning one, choose the Catalan Concrete Coffee Table from Sunpan to stir up conversations among your guests. 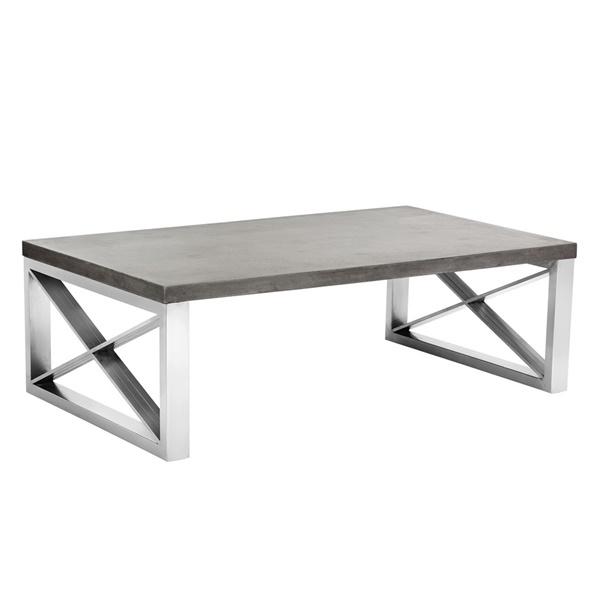 This distinct coffee table features a strong concrete top that helps enhance any living room's d�cor. In addition, the coffee table includes dazzling stainless steel legs that provide the table with a balanced, refined appearance that your guests are sure to appreciate. Give your living room a one-of-a-kind look and feel with the Catalan Concrete Coffee Table. Strong concrete top provides ample space, making the end table a top choice in any living room. Dazzling stainless steel legs provide the table with a balanced, refined appearance. Exceptional design ensures the end table can serve as a conversation starter for guests. Unique look and feel enable the table to stand out in living rooms of all shapes and sizes.